Experts say boosting documentation takes hospitalwide cooperation. With recovery audit contractors cleared to resume limited medical record requests and ICD-10 once again on the horizon, many hospitals are casting a critical eye on their clinical documentation improvement (CDI) initiatives—and some are finding they have fallen short of expectations. In many cases, limited success rates can be traced to a lack of cross-departmental data transparency and adversarial relationships between participants that can disrupt workflows and hamper productivity. "The biggest issue is that most CDI programs are developed with the physician as targets, not participants. CDI specialists are trained to fight the coders and fight the doctors," says Robert S. Gold, MD, CEO of DCBA, a clinical documentation services company. "Too many people who are training CDI folks are mandating that they gather tons of useless information … that has nothing to do with what is wrong with the patient but rather has to do with keeping a paper trail. That slows down productivity massively." Gold attributes breakdowns in CDI efforts to several recent trends. The first is broader EMR adoption and the push for more off-site chart reviews, which creates a disconnect between CDI specialists and physicians by hampering the ability to collect and share comprehensive patient information in real time. The second is a growing tendency to document primarily to satisfy Medicare diagnosis-related group (DRG) selection. Once the major complication or comorbidity (CC) has been identified, Gold says, "the DRG is already maximally affected so we don't care anymore." The problem is that limiting documentation to only that which impacts the DRG leaves much of a patient's story untold, he says, adding that it defeats the purpose behind using an EMR, the goal of which is to have patient data available to whomever has the authority to access them. "In fact, larger consulting companies … are still training CDI specialists in DRGs and encouraging massive involvement in data gathering and they are downplaying anything that doesn't affect the DRG," Gold says. "People can die of hypothermia, which is not a CC, so why go for it? It can kill you, that's why. They talk about care integration, severity of illness, and risk of mortality, but they preach about DRGs and Medicare. We don't care about the other [data] because they don't affect Medicare DRGs. We're ignoring 50% of the population with most CDI initiatives." When physicians don't feel they or their patients benefit from efforts to alter documentation practices, they are quick to disengage. This can limit the success of CDI initiatives by creating a disconnect between participants, says Kim Carr, RHIT, CCS, CDIP, CCDS, director of clinical documentation for HRS. "That's what I hear more than anything: Physicians want to know what's in it for them," she says. "It takes the entire organization's commitment to have a successful CDI program. There are those that say it should report up to HIM, nursing, or case management, but for a successful program, it's not so important where [the program] is located or to what department it reports. It comes down to the teamwork between physicians, coders, and the CDI specialists." Disillusionment with CDI isn't limited to physicians, Carr says. "Sometimes coders feel like they have no voice when there's a mismatch between the working and final DRG," she says. "The coder may feel that the CDI specialist, whether they are from HIM or nursing, has the final say and that, as the coder, they don't have a voice in the final DRG determination." Elevating teamwork requires eliminating the last vestiges of information silos and removing cross-departmental disconnects that have long plagued health information. Carr says educating coders, CDI specialists, and clinicians so everyone is on the same page can help organizations make progress. "Breaking down the silos [requires] communication and getting everyone involved in the process. Not just the concurrent review of the record while the patient is there, but also any third-party review or audits that occur postdischarge and postcoding," she says. "Communication across the organization will help keep the silos broken down. … Everyone should be informed of the outcomes and involved in decisions in order to reemphasize a common goal." A successful CDI program requires strong lines of communication between HIM and medical departments, as well as quality improvement, case management, and utilization review divisions. A CDI program "that is disconnected from these key departments will struggle with getting support from the HIM coding staff and physician buy-in," says Melanie Endicott, MBA/HCM, RHIA, CDIP, CCS, CCS-P, FAHIMA, senior director of HIM practice excellence, coding, and CDI product development for AHIMA. Poor communication can affect whether all appropriate information is included in the patient record. Further, "once the patient is discharged, the coder is responsible for assigning the final diagnosis and procedure codes. Having a feedback loop between the coder and CDI professional is crucial for discussing any conflicts in the documentation and providing education between the two areas," Endicott says. Key to addressing information silos and connecting departments is the CDI specialist, who is uniquely positioned to communicate with physicians while patients are still hospitalized. "Their concurrent review of the documentation allows them to look at all the areas that are impacted by clinical documentation, not just coding," Endicott says. These include areas such as quality improvement, core measures reporting, case management, and utilization review, all of which are "dependent upon accurate and complete documentation that the CDI specialist can be looking for in the record," she says. Grant Campbell, MSN, RN, senior director of nursing strategy and informatics for Zynx Health, identifies three areas affected by a disjointed CDI effort: safety, effectiveness, and efficiency. CDI must drive documentation that fully conveys all the details needed for a safe patient experience, including reason for admission and appropriate treatment. The goal should be to have all of the system's elements working together to prevent safety issues and avoid catastrophic events, he says. "Effectiveness comes in on a number of levels," Campbell says. "As clinicians, are we treating patients correctly and seeing the wanted outcomes? [This requires] a community of care or environment of care that contributes to effective communications with and across disciplines. … Efficiency is throughput. Is everyone rowing the boat in the same direction? The idea is that we have processes and the clinical documentation system is a reflection of those processes." Today's clinical documentation must do more than convey the patient's experiences while under a physician's care. It also must provide nurses, pharmacists, and case managers with a map of the patient's past, present, and future whereabouts so they can best determine the resources needed to complete their care. "Systems are evolving to where physician documentation isn't standing alone," Campbell says. "It's moving toward clinical documentation that is patient- and family-centric, and anyone on the team can document anything to do with that patient. "The first step to any problem is admitting you have one," he continues. "In some cases, it isn't very evident that they're not being as collaborative as they could be. The CDI specialist is like the judge or the facilitator. …They really are the individuals who first bring light to the fact that here is duplicate or redundant documentation, who can answer questions about what we want to collect, who should be collecting it, and who can see it." Indeed, Campbell says that finding better ways to collate and present patient data is a CDI specialist's most valuable role. Not fully understanding what different disciplines bring to the table in terms of data collection is one of the oversights affecting industrywide documentation improvement. "Typically, the model is to go to school, learn to document there, and that's what you think clinical documentation looks like," he says. "In the sense of a true national standard or baseline of information collected about patients, who collects it, and how we share it, we are putting a burden on physicians that can be quite daunting. We've done that with other disciplines, too. This happens across multiple disciplines, but physicians and nurses are most impacted because they are managing the patient." Carr says truly effective CDI requires support from the entire organization, including comprehensive buy-in for a concurrent query process that brings together coders, physicians, and CDI specialists in a way that doesn't disrupt workflow or slow productivity. "If you have a strong concurrent process, especially as we work toward ICD-10, this will help coder productivity on the back end because they don't have to stop and take the time to generate retrospective queries. Now your CDI specialist becomes your coder's best friend. The documentation has been clarified and the information is available at the time of final coding," she says. "Also, with concurrent queries comes real-time physician education. The more timely the physician education, the better and more accurate the documentation will be. The CDI specialist can help with that and in the end the quality of the documentation and coding will improve." The ultimate outcome for any CDI program includes a significant reduction in or elimination of retrospective queries. To reach this goal requires eliminating information silos and CDI specialists who can "bridge the gap and communicate with the doctors and coders," says Monique Fayad, CEO of ICDLogic. "Some hospitals understand this, while others have very small CDI departments that are clearly siloed." The latter hospitals "tend to rely very heavily on technology, thinking EHRs and CAC [computer-assisted coding] systems will satisfy the vast majority of their clinical documentation needs," she says. "They typically have small CDI departments and few physician champions for the size of their organization." In other words, an effective CDI program requires dedicated resources and must be designed to meet the hospital's unique culture, size, and environment. Most importantly, says Fayad, is the appointment of properly educated physician champions who can take the lead on gaining buy-in and long-term engagement from their peers. "Physicians were never properly trained on documentation in medical school. Now it's something they have to do as we move into the era of ICD-10. It is part of the business of medicine going forward," she says. "Having a physician champion who understands and appreciates that is critical to the CDI initiative." Gold takes it one step further. To be true CDI leaders, physicians must be educated not only on coding and terminology, but also on how and why they will benefit from the initiative. "The 'what's in it for me' approach is valuable as a resource to teach anyone anything," he says. "It has been known in the industry for the last several years that physician involvement in CDI is very important, more than just using it as a target. … You need a physician-friendly program up front and then you need to be able to measure results and give doctors the feedback that keeps them interested." Campbell concurs: "It sounds trite but it's true: Every professional on some level wants to know what's in it for them. Not that they're being selfish, but rather they want to know what will make them a better clinician, support their practice, and help them do what they love to do, which is to be a clinician." CDI should not be siloed nor should it be punitive. Bringing various disciplines together to share information and collaborate on its collection and exchange, and highlighting the importance of physicians, are all keys to success. "We need to step back and acknowledge the broader picture of what this documentation is supposed to do. What can we add to the clinical workflow that would make clinicians' lives easier?" Campbell says. While top-down support from the executive team and governing board is a key foundational element of smooth-running clinical documentation improvement (CDI) initiatives, "physician buy-in is integral to the success," says Wil Lo, MD, CDIP, CCA, an instructor at Temple University and a member of ICDLogic's CDI advisory board. Because physicians relate best to their peers, engaging them in a CDI effort is best accomplished by appointing a well-respected colleague to champion the cause. "The physician champion will serve as the cornerstone of the CDI program and will work closely with a team of CDI experts," Lo says. "With support from the executive team, the physician champion will spearhead the CDI process by scheduling mandatory, periodic meetings with directors or designated representatives from the HIM, coding, utilization review, and clinical divisions." To illustrate how a CDI program benefits patients, physicians, and the facility as a whole, a physician champion must be familiar with documentation nuances and coding vocabularies. Lo says it's particularly important for the physician champion to explain "in a succinct fashion the intricate relationship between proper documentation and optimal patient care and improved treatment outcomes." Also important is explaining CDI's connection to accurate facility and physician profiling, appropriate severity of illness and risk of mortality scores, improved patient safety indicator ratings, proper reimbursement, and decreased denials. As the program evolves, the physician champion can discuss general documentation guidelines that apply to the entire medical facility and task directors or assigned representatives to leverage those principles to create a manageable list of specialty-specific recommendations. Schedule follow-ups with each division to support the effort, which all physicians should be expected to implement. Eventually, the physician champion will be asked to help explain CDI metrics and share the aggregate data with every specialty on a periodic basis. Doing so "will chart the progress of documentation improvement and may spur the lagging specialties to seek additional guidance to improve their documentation practices," Lo says. "Depending on the culture and the physician buy-in for a medical facility, it may take months to years for all of the specialties in a medical facility to adopt proper documentation practices," he adds. 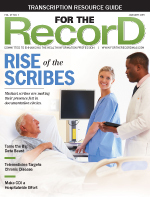 "Although silos will continue to exist between the HIM, coding, utilization reviews, and clinical divisions, the physician champion can hover between these divisions and encourage the collaboration and exchange of best practices for documentation so that the patients, the physicians, and the facility can reap the benefits."